This week, MusicRow celebrated several Nashville songwriters whose compositions skyrocketed to the top of the MusicRow CountryBreakout chart. 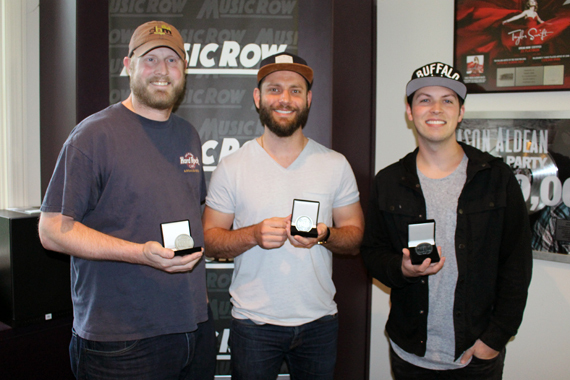 MusicRow honored Jason Duke, Ryan Griffin and Josh Kerr for Kelsea Ballerini‘s “Dibs,” which topped the MusicRow CountryBreakout chart on Dec. 10, 2015. Joining them for the celebration were industry executives from Dan Hodges Music, Black River Publishing and Black River Entertainment. 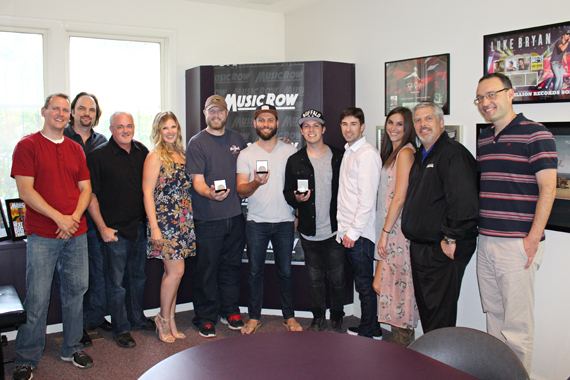 Duke, Griffin and Kerr co-wrote the song with Ballerini, who accepted her MusicRow Challenge Coin during MusicRow‘s CountryBreakout Awards in February. Pictured (L-R): Songwriters Jason Duke, Ryan Griffin, and Josh Kerr. Another gathering was held this week for songwriter Josh Mirenda, who co-wrote Dierks Bentley‘s “Somewhere on a Beach.” The song topped the MusicRow CountryBreakout chart on April 21. Mirenda co-wrote the song with Michael Tyler, Jaron Boyer, Alexander Palmer and Dave Kunico. Tyler and Boyer received their coins in April. 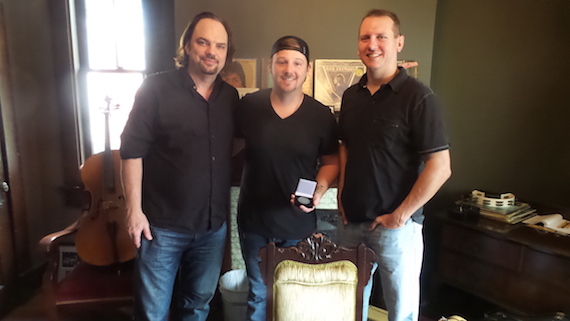 Pictured (L-R): MusicRow‘s Sherod Robertson, songwriter Josh Mirenda, and MusicRow‘s Troy Stephenson. Since 2014, MusicRow has distributed No. 1 Challenge Coin to the artists and songwriters who have achieved a No. 1 hit on the MusicRow CountryBreakout Chart. See the list of recipients.